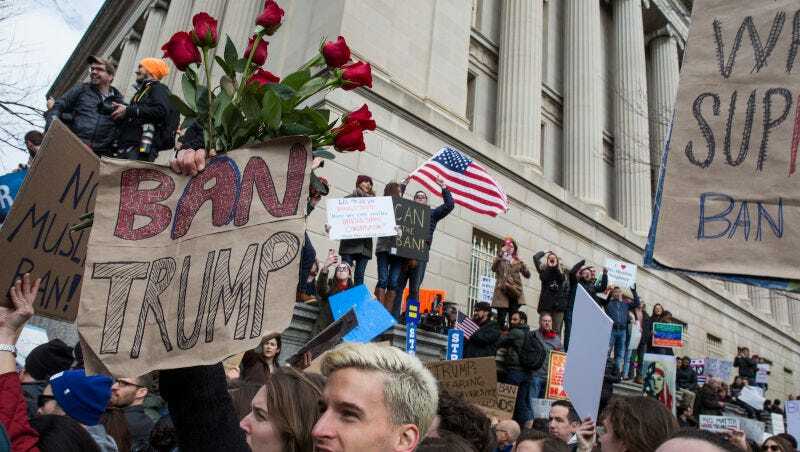 Sixty thousand visas cancelled under il Duce Trump last week have been restored by a Bush-appointed federal judge who temporarily blocked the executive order, the State Department announced today. ABC reports that the State Department reversed the provisional revocation of the visas, meaning that those affected by Trump’s seven-country blanket ban may resume travel immediately. The Department of Homeland Security also stopped implementing portions of the executive order following a Friday ruling by a U.S. judge in Washington state. Christiansen added that the Trump administration will seek an emergency halt to the judge’s order as soon as possible. The lawsuit was filed by Washington Attorney General Bob Ferguson three days after Trump signed the executive order, the Hill reports. It argued that the travel ban targeting Muslims from seven countries violates the constitutional rights of immigrants and their families. Federal judge James Robart ruled Friday that the executive order would be stopped nationwide, effective immediately. CBP told major American airlines in a conference call late Friday that they should promptly resume “business as usual,” CNN reports. The ruling applies only to those with valid visas. It’s unclear how many travelers will remain in limbo because their visas were cancelled.